Home > Horse Sense > For NYRA’s Starting Gate Crew, Every Horse Matters. For NYRA’s Starting Gate Crew, Every Horse Matters. 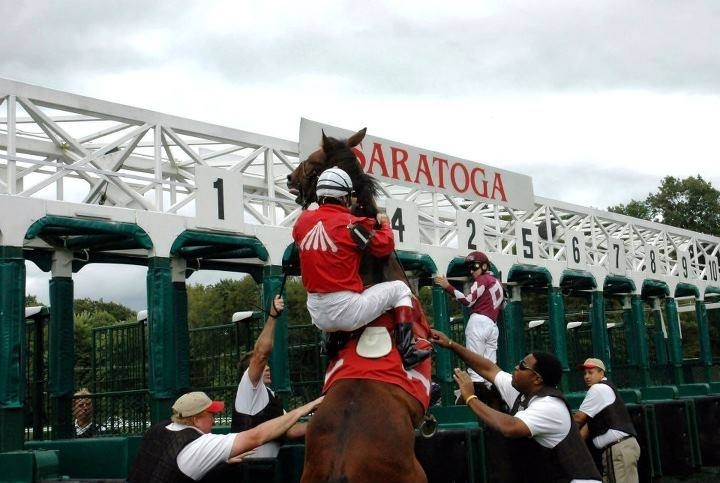 I’ve written about the NYRA starting gate crew in the past, including here at Saratoga.com. I believe that previous missives have been “love letters,” so to speak. Gushy and full of admiration for the Cowboys of Horse Racing. But tonight I’m writing about them–but to you, my readers, specifically. If you’re reading this, you’re probably a fan of horse racing. Ergo, chances are pretty great that on June 7th you’ll be either a) at Beautiful Belmont Park or b) glued to your TV or computer screen, watching every minute of the action. But are you catching ALL the action? Might you be at the races or otherwise watching with new fans? Friends who don’t know all the people who make racing happen? Do me a favor. 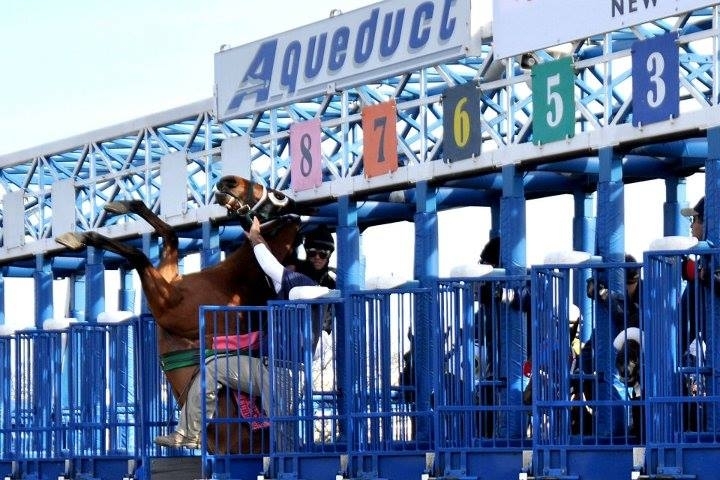 Do yourself a favor–and your new-fan friends a favor–and watch carefully the actions, facial expressions and intense professionalism exhibited by the NYRA Gate Crew. 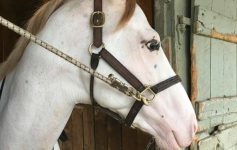 Theirs is never an easy job–and God knows, on Belmont Stakes Day, with the Triple Crown on the line (AGAIN), they’ll have challenges that happen no other day of the year. Gate Crew goes through on Belmont Stakes Day. I’ve stood on the other side of the track–near the finish line–for the race. It was the single coolest, most amazing experience of my Life. Surreal, actually. I felt outside of my body from the minute we got to the other side–after slogging across the deep, deep dirt of Big Sandy. The surreal nature of the moment was partly because jeez-Louise, I just could not believe that I was there. One of precious few people to be so privileged. I felt abundantly blessed…and then…sort-of…terrified. From the minute that the gigantic Belmont Park starting gate began its journey into position for the start of The Big Race–the screaming began. (Not me.) No, the 85,000 people on the other side of the track screamed their lungs out, incessantly–a wall of sound that nearly knocked me over,. (Sound is a physical thing, you know–the fact that we can’t see it is not an indicator that it’s not physical.) The sound waves, like ocean waves, carried their long, loping way out of that building–across the track–and smacked me (and everyone else there) full-on in the face and body. For a nanosecond, I had a deep appreciation for how the English must’ve felt at the Battle of Agincourt in 1415, facing 50,000 mounted French knights. Difference was that the English had cross-bows, whereas I had only my relative sanity onto which to hang. That sound was so loud that honestly, I tried to organize my thoughts but could not. 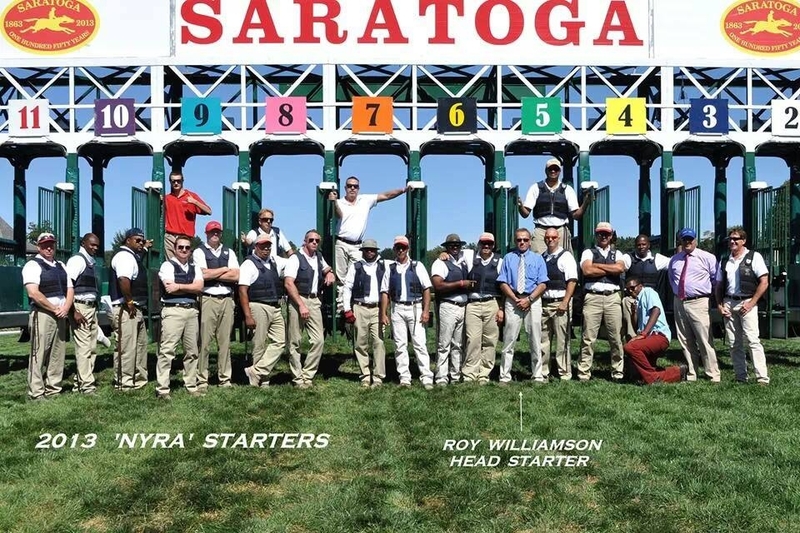 When finally I could, I looked at NYRA Starter, Roy Williamson and his Gate Crew. …when the horses are not-yet ready to go from the gate. Half-a-second later, the gate explodes and several tons of horseflesh and jocks storm toward Destiny. My personal experience was that I–a mere fan, a spectator–was being buffeted about like a paper boat on a roiling sea. How I felt didn’t matter, in The Big Picture. But the Gate Crew? Their job was to get every single one of those horses into that gate safely and CALMLY–and get them out on the other side, without incident. Frankly, it amazed me that the horses–you remember horses? Prey animals? Skittish by Nature, because skittish is an instinct of preservation?–were hearing the same cacophony that I was. And their ears are larger, and can swivel all the way backward. 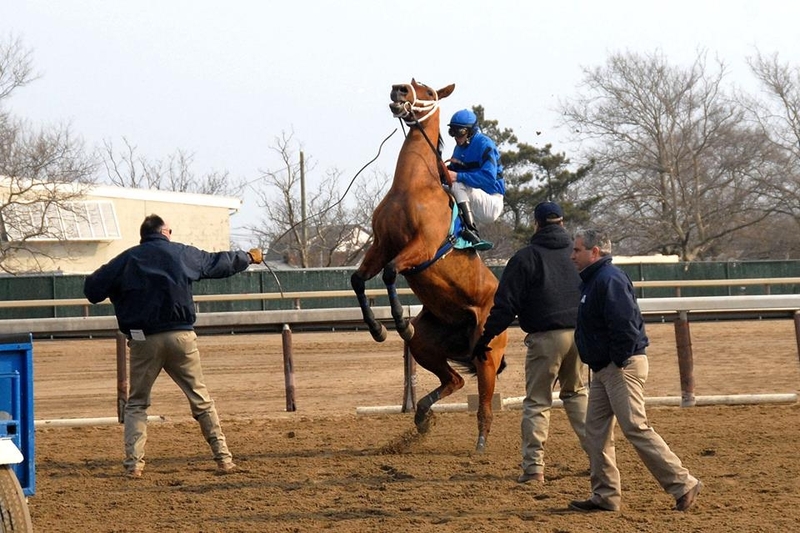 Considering the volume of the masses, assaulting the air over Elmont, New York–I am in awe that the horses didn’t lose their minds. I almost did. But apparently Thoroughbreds get used to that noise–it just gets louder as the stakes get bigger. So Roy and his Gate Crew couldn’t hear a dagnabbit thing–and yet, once again, they got every single horse calmly into the gate, and safely on their way around Big Sandy. So this June 7th–fingers crossed–the Triple Crown will be on the line–and that crowd of 85,000 will probably bloat to 160,000. And the Wall of Sound will double. The Big Challenge on Belmont Stakes Day, as I see it–is that Wall of Sound. It is NOT that the Triple Crown is on the line. NOT that California Chrome and other very special Thoroughbreds will be in their care. NOT that all the other races that day are huge–and that, therefore, the horses are any more special. Why not? Because…every horse is special to the Gate Crew. That is a wonderful thought. Whether a $15,000 claimer or the next Belmont Stakes winner–every horse is approached with the same goals in mind. Calm them down, nurture their good vibes, assuage their fears. As a woman who owns the equivalent of an eyeball of a race horse–I find that to be an immensely comforting thought. My horse will be treated with the same concern as the most financially valuable horse, ever. This is not to say that the “big horses” are treated like “average” horses–no, flip that script. Every horse on a NYRA track is in the care of a Gate Crew who know horses, from the physiology-out. People who have worked with horses all their lives–who probably were born in the saddle. Men who know that horses–regardless of achievements–all have the same evolutionary instincts, and similar responses to enclosed spaces, and Fear of the Unknown. The races on June 7th will have higher purses–the Triple Crown will be on the line–the air will be electric with anticipation and unbridled excitement. So rest assured, good readers, that every horse who races that day–and then again, on Sunday, June 8th, and every day after–will be treated not so much as royalty, but as a valued, sentient being in the hands of the world’s best caregivers. So do yourself a favor–and educate your friends who are new fans–to watch the actions of the Gate Crew on Belmont Stakes Day. It takes a special person to handle a 1,200-pound animal, any animal. But our Thoroughbreds all are special, and they get ’em in and out with great grace and profound respect. Many sincere thanks to Dan Heary, for use of his Gate Crew photos.